The Rebel Crickethopper has been catching fish for almost 20 years! These are designed to resemble crickets and grasshoppers during different stages of the year. Not only can they be fished as a topwater but a crankbait as well. 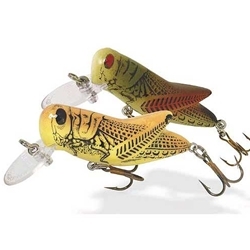 They are offered in two sizes: Crickethopper- 1-1/2", 3/32oz, #14 hooks and the Bighopper- 1-3/4", 1/4oz, #10 hooks, both of which have a cranking depth of 0-3ft.